Pigeon Forge is an intriguing resort town in the U.S. state of Tennessee, which offers many opportunities for rest and relaxation in the beautiful scenery of the southeast United States. This mountain village, which has only about 50 000 inhabitants is one of the starting points for the National Park of the Great Smoky Mountains, which is considered the most visited park in the U.S.. Annually, over 11 million tourists go to the beautiful mountain peaks and hills, but before that, they must pass through Pigeon Forge. The town is a popular resort and one of the fastest developing tourist sites in the south. 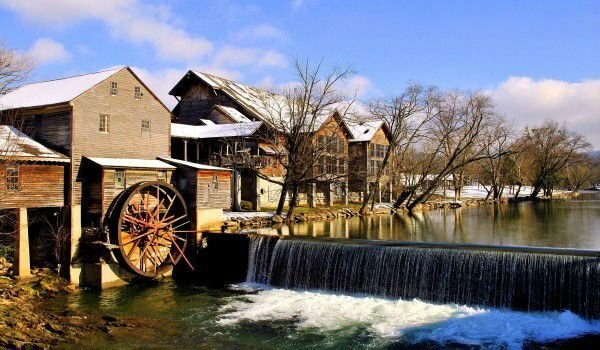 Here guests can choose activities from a walk among the natural beauty around Pigeon Forge, which still offers old-fashioned hospitality and a "country culture", to even more extreme engagements. Pigeon Forge can be reached by Highway 441. About five miles from the resort is Gatlinburg, 35 miles northwest of Knoxville. The name Pigeon Forge was received in 1820, when Isaac Love built his smithy on the banks of the small creek Little Pigeon River. His craft building was demolished in 1855 and in its place was built a mill, which to this day works with its old mechanisms. Known as the Old Mill, this building was declared a national monument, which is already a good 150 years old. Today Pigeon Forge is an attractive place for millions of people, because the town offers a wide range of amusement parks, hotels , historical and natural attractions , nice restaurants, small music theatres, golf and mini golf, camping opportunities, etc. Pigeon Forge began to grow after the establishment of Great Smokey Mountains National Park, in 1934 and now this huge biosphere reserve, occupying an area of about 2, 108 square kilometres is included in the UNESCO list of World Heritage sites. Today, this is the greatest challenge and attraction for guests of Pigeon Forge . One of the biggest attractions of this village is a typical American theme park - Dollywood, which is owned by the country singer Dolly Parton. This huge space was an open roller in 1961 but is known as Dollywood since 1986. For it care some 3, 000 employees, which creates the largest employment in the region. Among the attractions are the park's coasters, boating and various museums such as the Southern Gospel Museum with its Hall of Fame. Separately, this park in Pigeon Forge hosts different music festivals and concerts throughout the year. The town is full of music and small theatres, which offer many themed shows with music and entertainment. Among them are the Country Tonight Theatre, Comedy Barn, The Black Bear Jamboree Dinner Show, Miracle Theater (located at the entrance of Dollywood) and others. Another attraction in Pigeon Forge attracts millions of visitors annually, though. This is the Titanic Museum, which is a two-storey exhibition building in the form of the eponymous epic ship. Opened on April 8, 2010, the Titanic museum recreates the outer half of the ship's construction. Inside are organized 20 galleries, where you can see about 400 artefacts and objects related to the legendary ship. This museum is in Pigeon Ford and is considered the largest Titanic museum in the world. Its construction cost $ 25 million.